One of the Fox Cities’ newest and most inventive social enterprises was honored Oct. 14 by Lawrence University during the college’s sixth annual Report to the Community. Riverview Gardens was presented Lawrence University’s Collaboration in Action Award as part of the report. 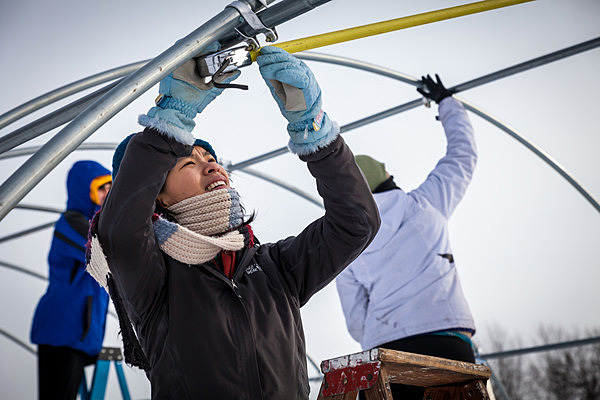 Lawrence students helped construct hoop houses last January at Riverview Gardens, the recipient of Lawrence’s 2014 Collaboration in Action Award. Students contributed a total of 1,038 volunteer hours to Riverview Gardens last year. The award recognizes an individual or organization, who, in partnership with Lawrence, has provided exemplary service to the Fox Cities community through strategic vision, leadership influence, long-standing commitment and enthusiasm, financial contributions and/or volunteerism. Riverview Gardens was founded in December 2011 on the grounds of the former Riverview Country Club on Appleton’s south side. As a self-sustaining social venture, it engages Fox Valley residents in community stewardship of a market garden, community park space and job training program. It seeks to assist local outreach organizations and build financial resources to help address the root causes of poverty, homelessness and unemployment. Since embarking on its mission, Riverview Gardens has utilized Lawrence students with expertise in sustainable agriculture provided by the Sustainable Lawrence University Gardens (SLUG) and the college’s environmental studies program. During the 2013-14 academic year, more than 300 Lawrence students contributed 1,038 volunteer hours at Riverview Gardens, the most of any of the 144 area agencies at which students served. Two recent Lawrence graduates, Oren Jakobson (2011) and Hava Blair (2013) turned their student involvement with environmental and sustainability issues into key leadership roles with Riverview Gardens after they graduated. Jakobson, who led the permitting process involved with establishing a bee colony on campus, serves as Riverview Gardens’ director of farm operations. Blair, who conducted an independent study project that created a wetlands restoration plan for Riverview Gardens, is the manager of farm sales and markets. Lawrence’s connection to Riverview Gardens also includes executive director Cindy Sahotsky and ServiceWorks outreach coordinator Ronan Christman, 1984 and 2013 graduates, respectively. 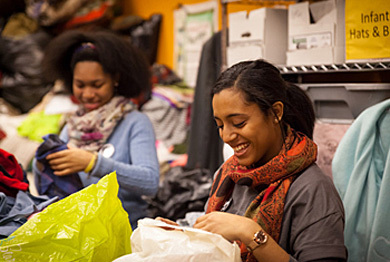 Bethesda Thrift Shop, where Lawrence students help sort donated items, was one of 144 community agencies in the Fox Cities served by Lawrence student volunteers in 2013-14. Riverview Gardens joins the Boys & Girls Club of the Fox Cities (2013), the Appleton Area School District (2012), the YMCA of the Fox Cities (2011) and the Mielke Family Foundation (2010) as previous winners of Lawrence’s Collaboration in Action Award. • Lawrence faculty and staff volunteer and make contributions to 133 community agencies, serve on the boards of 46 local nonprofits while spending an average of 71.4 hours a year volunteering in the community. • 71 different Lawrence student organizations volunteered in the community in the past year. • 52 percent of Lawrence students — 785 — volunteered during the 2013-14 academic year, contributing 12,420 volunteer hours to 144 community agencies. • Lawrence Academy of Music teachers and students provided 74 free community concerts, recitals or master classes during the 2013-14 academic year. • 35 local employers provided internships to 45 Lawrence students. • 73.1 percent of the Wisconsin vendors used by Lawrence University in the 2013-14 fiscal year were located in the NEW North Region. • Lawrence spent $5,438,819 in the NEW North Region during the 2013-14 fiscal year. • 2,026 Lawrence alumni live in the NEW North Region. Lawrence President Mark Burstein will present the fourth annual Lawrence University Collaboration in Action Award to the Boys & Girls Clubs of the Fox Valley. The award recognizes an individual or organization, who, in partnership with Lawrence, has provided exemplary service to the Fox Cities community through strategic vision, leadership influence, long-standing commitment and enthusiasm, financial contributions and/or volunteerism. “Our relationship with Lawrence has provided low-income and at-risk youth with socialization skills, academic guidance and positive role models that we hope can help them ‘break the cycle,’” said Overstreet. Earlier this year, Lawrence was named to the President’s Higher Education Community Service Honor Roll for the seventh consecutive year. The honor roll recognizes higher education institutions that reflect the values of exemplary community service and achieve meaningful outcomes in their communities. Nine hundred and eighty-nine students contributed more than 16,650 hours to community volunteer and service-learning programs in 2012. Lawrence is one of only two Wisconsin institutions that has been cited every year by the Washington, D.C.-based Corporation for National and Community Service (CNCS) since it launched the honor roll program in 2006. For more than 150 years, Lawrence University and the Appleton Area School District have been in the business of educating young people. Through partnership and collaboration, the two institutions have bolstered their common missions of providing the highest quality instruction and rich learning environments for their students. Renee Boldt, a 1985 graduate and member of the college’s Board of Trustees, served as the event’s emcee and Cathie Tierney, president and CEO of Community First Credit Union, was the featured speaker. The Lawrence University Collaboration in Action Award recognizes an individual or organization, who, in partnership with Lawrence, has provided exemplary service to the Fox Cities community through strategic vision, leadership influence, long-standing commitment and enthusiasm, financial contributions and/or volunteerism. 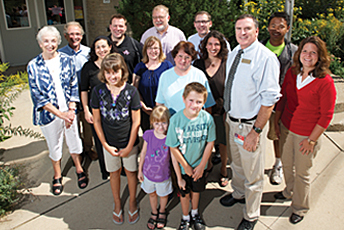 Previous recipients of the award include the Mielke Family Foundation (2010) and the YMCA of the Fox Cities (2011). FRONT ROW (L. to R.): Cassidi Wing, kindergarten student, Edison Elementary School; Kyan Wing, 2nd grade student, Edison Elementary School. SECOND ROW: Justyce Schultz, 5th grade student, Edison Elementary School; Barbara Wing, grandmother of Justyce, Cassidi and Kyan. THIRD ROW: Monica Rico, associate professor of history and Pieper Professor of Servant Leadership, Lawrence University; Kristi Hill, director of volunteer and community service programs, Lawrence University; Karen Bruno, director of the Academy of Music, Lawrence University; Jim Donnellan, Edison Elementary School principal; Lisa Sprangers, Grade 5/6 teacher at Edison Elementary School. 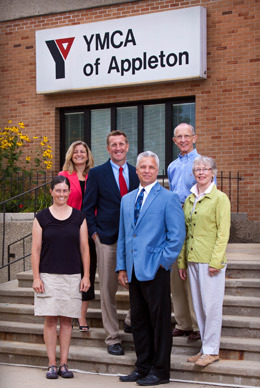 TOP ROW: Sharon Fenlon, AASD board president; Stewart Purkey, associate professor of education and Bee Connell Mielke professor of education, Lawrence University; Brian Bartel, chemistry teacher, West High School, and 1997 Lawrence University graduate; Lee Allinger, AASD superintendent of schools; Jon Meyer, director of the Young Band Project, Lawrence University; Adam Tenasaputra, Lawrence student and LARY Buddy. “The Appleton Area School District is an essential partner to Lawrence University, as it provides unmatched opportunities for our students interested in serving our community and working with youth,” said Beck. Superintendent Lee Allinger said the Appleton Area School District is “proud to be recognized with this award. Among many collaborative programs conducted between Lawrence and AASD are the LARY Buddies mentoring and VITAL Tutoring programs. Each has connected Lawrence students with area elementary students for decades. The Lawrence Academy of Music has worked closely with AASD school administrators and music teachers to develop the Young Band Project and Strings Project. They enhance the music offerings of local schools and provide music instruction to students who otherwise might not have the opportunity. Jerry Koleske, Lincoln Elementary School band teacher, sees the music programs as a classic win-win situation. “Lawrence students receive teaching experience and are mentored by seasoned music teachers. The elementary students receive regular music instruction and consistent teaching that is greatly enhancing their level of competence,” said Koleske. The AASD also has provided fertile student-teaching opportunities for aspiring Lawrence student educators. “Although we are confident Lawrence students make a positive contribution to the Appleton school community while engaged in these activities, the fact remains that we could not certify Lawrence students for licensure as public school teachers without the cooperation and good will of AASD teachers and administrators,” said Stewart Purkey, Bee Connell Mielke Professor of Education. Many Lawrence graduates go on to teach in the AASD. Those same teachers — along with many others from the area — often return to Lawrence for valuable professional development such as the college’s Mielke Summer Institute in the Liberal Arts, in which area educators explore new ideas and examine timely issues of social and cultural importance from a multidisciplinary perspective. • Lawrence’s “Adopt-an-Agency” program, which helps graduating students pass their work seamlessly along to other students, providing improved continuity and building lasting relationships between local nonprofits and student organizations. • A collaboration with the History Museum at the Castle that involved Lawrence students and faculty assisting with exhibition research, creating a historic walking map of Riverside Cemetery and, in conjunction with the museum’s “Leonardo da Vinci: Machines in Motion” exhibition, youth programming focused on the inventor’s legacy as both scientist and artist in conjunction with the AARD and the Appleton Public Library. • A summer seminar series focused on a wide variety of topics geared toward Fox Valley community members led by Lawrence faculty and local experts. • The community “Chalk Talk” art project that brought together Lawrence art students and clients of the Housing Partnership of the Fox Cities. Together they explored probing questions like “What are you?” and “How do you think others see you?” that formed the basis for portraits reflecting each client’s “sense of self.” The portraits became part of a May 2012 community exhibit that countered stereotypes about homelessness and poverty. • A project designed to reveal the human emotions — fear, loneliness, pain, shame — people hide behind invisible masks. The result was a theatre production that melded together vignettes interpreting the gamut of emotional experience, based in part on contributions from a suggestion box at Harmony Café. Community members submitted their own script ideas, including personal thoughts, memories, poems or quotations. Project participants also constructed their own papier-mâché masques as a way of exploring emotion through physical action. • A profile of some of the more than 1,600 Lawrence alumni who make their home in the Fox Cities and northeast Wisconsin. Lawrence’s commitment to integrating civic service into the curriculum and campus culture was recognized with its sixth consecutive selection to the 2012 President’s Higher Education Community Service Honor Roll. Lawrence is one of only two Wisconsin institutions that has been cited every year by the Washington, D.C.-based Corporation for National and Community Service since it launched the honor roll program in 2006. 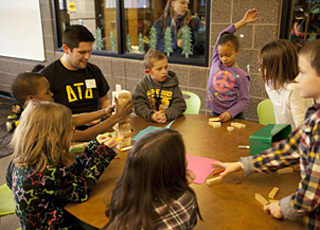 During the 2011-12 academic year, 706 Lawrence students volunteered more than 9,525 hours of service, including 7,676 hours at 79 different Fox Cities charities and schools. The YMCA of the Fox Cities was presented the 2011 Lawrence University Collaboration in Action Award this morning (10/4) during the college’s third annual “Report to the Community.” Nearly 150 community leaders attended the event, in which Lawrence President Jill Beck discussed the college-community relationship. Oscar Boldt, chairman of The Boldt Group, served as emcee of the event, while Joyce Bytof, CEO of Coldwell Banker The Real Estate Group, Inc., was the program’s featured speaker. The Lawrence University Collaboration in Action Award honors an individual or organization, who, in partnership with Lawrence, has provided exemplary service to the Fox Cities community through strategic vision, leadership influence, long-standing commitment and enthusiasm, financial contributions and/or volunteerism. Lawrence University and YMCA of the Fox Cities leadership and supporters celebrate the Lawrence University Collaboration in Action Award. From left: Erin Buenzli, director of wellness and recreation at Lawrence; Danielle Englebert, YMCA of the Fox Cities district executive director; Cal Husmann, vice president for alumni, development and communications at Lawrence and YMCA of the Fox Cities corporate board member; Bill Breider, president/CEO of the YMCA of the Fox Cities; Chuck Merry ’57, Lawrence alumni board member and YMCA of the Fox Cities board of directors member; and Bonnie Buchanan ’62, former president of the YMCA of the Fox Cities board of directors and former Lawrence alumni board member. A community force for more than a century, the YMCA of the Fox Cities boasts more than 160,000 community members who participate in a YMCA program or activity on an annual basis. It collaborates with more than 350 local organizations, including Lawrence University. Collaborations between the YMCA and Lawrence date back many years. In 2005, a formal partnership was established with Lawrence students offered free memberships to the Appleton YMCA. In 2010, 725 Lawrence students visited the YMCA 12,541 times. The YMCA also offers a membership discount to Lawrence faculty and staff, has provided free passes when Lawrence’s Buchanan Kiewit Wellness Center has been closed during academic recesses and has provided wellness programming on Lawrence’s campus, with plans for more in the current academic year. “The YMCA has been a leader in wellness initiatives. I look forward to collaborating with the YMCA for on-site wellness programming to offer opportunities for our staff, faculty and students to strive to enrich their spirits, minds and body,” said Erin Buenzli, Lawrence’s director of wellness and recreation. Lawrence and the Appleton YMCA have shared a number of resources over the years. Through a work-study program funded by both organizations, Lawrence students offer one-on-one tutoring at the YMCA to elementary and high school students. They provided more than 200 hours of tutoring in 2010. The YMCA uses Lawrence facilities for programming at no cost: Lawrence is home to the YMCA Summer Tennis Camp and the YMCA uses Lawrence’s aquatic facilities to increase participation in its swim team program. The Warch Campus Center also has hosted several events for the YMCA, including the Strong Kid’s Victory Celebrations. Cal Husmann, Lawrence’s vice president of alumni, development and communications, serves on the YMCA of the Fox Cities Corporate Board and chairs the Development Committee, helping to raise funds that support and enhance YMCA programs, services and facilities. Whether transforming an empty College Ave. storefront into a temporary “pop-up” gallery for local artists to showcase their talents, counting and monitoring bats at Menasha’s Heckrodt Wetland Reserve or conducting research aimed at assisting local health care providers improve delivery of their services, Lawrence collaborations and partnerships exemplify the college’s commitment to fostering a caring Fox Cities community. Including their involvement with the YMCA, 605 Lawrence students volunteered more than 6,800 hours of service, including 2,800 hours at 47 different Fox Cities charities and schools during the 2010-11 academic year while Lawrence faculty and staff members served on the boards and committees of nearly 40 area nonprofit organizations. The integration of civic service into the curriculum and culture at Lawrence resulted in the college being named to the President’s Higher Education Community Service Honor Roll for the fifth consecutive year in 2011. Lawrence is one of only two Wisconsin institutions to receive this honor every year since the Honor Roll was established in 2006.